GANA – Star Creek Kennel, L.L.C. The Goldendoodle Association of North America, Inc. (www.GoldendoodleAssociation.com) is a non-profit organization established in January, 2009. GANA’s primary objective is to guide breeders in the development of the Goldendoodle to the common goal of establishing reliability in coat, type, health, and temperament. 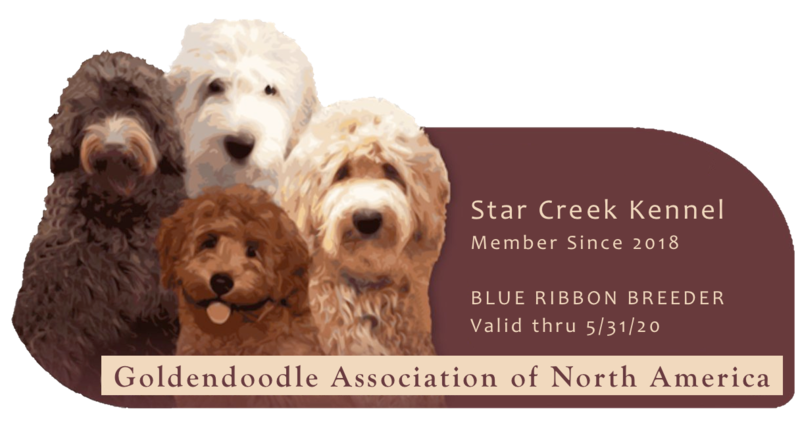 GANA is the first and only breed club established for the Goldendoodle. A registry database has been created to document the lineage and only Goldendoodles, Golden Retrievers, and Poodles registered with GANA will produce offspring registerable with GANA. Membership is limited to breeders that provide proof of health clearances achieved on all their breeding stock and that have agreed to a Code of Ethics regarding their breeding practices and the care of their dogs. To ensure you are working with a breeder that meets these standards, look for the GANA logo on their website.